Would you like your home to be selected as a film location for a movie, TV show or commercial? The Georgia Film Office receives a wide variety of location requests from many different film productions, and the most requested locations are for private residences. Almost every character in any film or television show lives in a home, so producers are always looking for more homes of all types and not just estates and mansions. 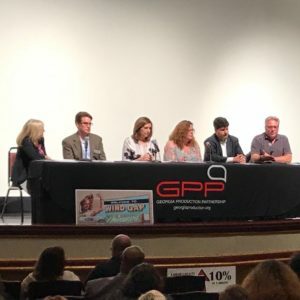 Georgia Production Partnership (GPP) recently hosted a Mid-Georgia Regional Meeting and gave recommendations to local property owners who wish to have films shot at their location. The best way to be selected as a film location is to promote directly with the Georgia Film Office. Submit your property photos through an online location submission form that lists the specific guidelines that must be met in order to be considered. After the Georgia Film Office receives the property submission, they will then review your photos. If approved, your property will be added to an online locations database, which is publicly viewable on GA Reel Scout. It is recommended that homeowners submit the appropriate quantity and quality photos that will provide proper coverage of their homes. Regarding quantity – more is better. At least 4 shots per room from each corner. Regarding quality – try take the same approach as you would when selling your home on MLS. It can even be from your mobile phone if you follow the guidelines on the submission form. There is no need to hire a photographer or worry about a fancy camera if you do not have access to one. It is more important to get your property listed in the database, so do not stress too much about the “artistic” look of your photos. If a production is interested in your location, they will send a location scout to take photos for the director to see if there have been any changes to the property and confirm contact information. Contact the Camera Ready Communities liaison in the county where your property is located. These county liaisons work directly with production companies, so they would be the best point of contact for promoting your property. In some cases, they may be able to refer a location scout photographer to shoot your property. At the very minimum, the production should provide a location agreement and proof of insurance prior to filming. A location agreement is a contract between a film production company and the property owner that covers use of the owner’s property in the film. Also, the film production should be covered by production insurance, and the production company should be able to provide a Certificate of Liability Insurance (COI) prior to filming. During filming, the experience can be both fun and exciting for homeowners, and yet also feel a little intrusive. Commonly described as “when the circus comes to town”, it can be a bit of a surprise if someone has never seen a film production before. There are 12+ hour filming days that may include prep days of furniture rearranging and painting along with a large number of crew members on your property. Regarding price negotiations, location fees depend on several factors including the budget and scale of the property use. At the end of the day, it should at least be a price at which the inconvenience will be worth it to you. In most cases, a deposit or partial payment is given prior to filming. Reputable Location Managers in the film industry always provide a Location Agreement and COI prior to filming, so proceed with caution if you encounter someone who tries to bypass this. When in doubt, contact the Georgia Film Office to verify if a location request is legitimate. The Location Agreement should include an indemnification clause which is a provision in the contract stating that the production company commits to compensate the property owner for any harm, liability or loss caused by the production. Here is a sample location agreement from Georgia Film Office. Property owners can verify the existence of property insurance coverage by contacting the insurance agency directly to confirm the effective dates and the specific film production covered. All COIs will have a contact name and number in the upper right hand side of the certificate.